Getting ready to open a new restaurant can be overwhelming. There are some many different areas to consider, from financing to staffing. Read on for ten basic areas you should understand before opening the doors. It should be a simple enough concept to understand. Owning a restaurant means you will be at work a majority of the time, especially in the beginning. Do you like weekends, holidays, and your kids' birthdays? What about romantic dinner out on Valentine's Day or attending a fun New Years Eve party? Well too bad, because chances are you get to work those days. Those are work days. It takes a certain amount of self-confidence to start your own business, especially a restaurant. And that's a good thing. But don't get ahead of yourself. Opening a restaurant isn't like the movie Field of Dreams. If you build it, they might come. Or they might just say they will come. Or they might show up once and never come back. I don't mean to sound well...mean, but people will lie to you without thinking twice if they think that is what you want to hear. Even though there are many successful family-owned businesses, including restaurants, you should be careful of hiring from either group. You change the whole dynamic of your relationship when you become a family member or friends boss. A business plan is especially helpful to those new to the food/restaurant industry. 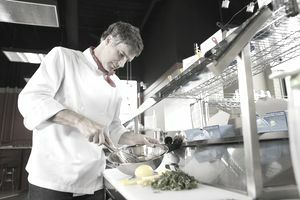 As you research information for your restaurant business plan, you may encounter problems you hadn't considered previously, such as licensing, health codes and tax laws. Many people dream of opening a new restaurant. However, finding enough financing for a new restaurant can be a major stumbling block for many people. So here is a step-by-step guide for those serious about opening a restaurant. People who want to open their own restaurant often view local restaurants with a jaded eye. "I can make better shrimp scampi than this place." "If I owned this restaurant, I would never have a TV at the bar." Be careful not mix personal prejudices with business. There is something about these other restaurants that appeal to patrons. Even if you don't like the idea of a TV at the bar, most customers do enjoy it. When studying the competition, ask yourself, Why do people come here? What's the appeal? Then find it and figure out how you are going to either bring it to your own restaurant or even better, do something unique that no one else offers. The ideal restaurant menu offers a balance of unique dishes and old favorites. You want to intrigue customers with new takes on food they are comfortable eating. Consider the basic burger. You can offer it in classic form- plain or with American cheese. And you can also offer a unique version, one that fits with your restaurant theme, like topping a burger with guacamole and pepper jack cheese for a Mexican themed restaurant. Check out 10 things you should know about restaurant menus. Nothing is more frustrating than an unclear restaurant concept. For example, a restaurant that offers over 200 beers, yet has tablecloths. Are you a micro-brew house or a fine dining establishment? Pick one already! Read more about restaurant concept. Before you create a business plan, write a menu, or dash off to the bank to apply for a loan, you must first decide where exactly your restaurant is going to be located. A restaurant's location is as crucial to its success as great food and service. It will influence many parts of your restaurant, including the menu. If you already have a certain restaurant location in mind, don't get too attached until you know if it has all the right requirements for a successful restaurant. While there are definite benefits to being your own boss, there are serious drawbacks as well- like never having a day off. Friends and family may declare you the world's best cook, but cooking at home and cooking for the masses are two different things.